Tom says: “I developed the Anatomy Trains during the 1990’s, as a game for students to play when I was teaching Fascial Anatomy at the Rolf Institute. I was inspired by Ida Rolf, and have been practicing the deep fascial work I learned from her since 1976. “But when I came to try to teach, all the books you can find put forward the ‘single-muscle’ theory. 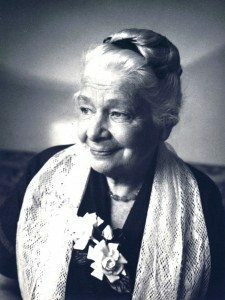 Ida Rolf kept saying, “It’s all connected through the fascia.” Other than invoking the image of a grapefruit or a loofah, how do you make this real? How do you get ‘actionable intelligence’ on the functioning of the whole musculoskeletal system? “Just as an exercise to cement the students’ knowledge, I began stringing the muscles together through the fascia. This idea was initiated when Dr Jim Oschman gave me an article by Raymond Dart (the anthropologist and Alexander Technique student) linking the muscle in the trunk in a double-spiral arrangement (which shows up here as part of the Spiral Line). “My reaction was, “Why stop there?” From this base, I expanded Dart’s idea to the whole body, to help students see connections by stringing muscles together. The ‘rules’ are that the connections have to follow the grain in the fascial fabric in more or less a straight line, without breaks or changing levels. “After a few teaching iterations, the whole project became so interesting that I started to systematize these connections. With the encouragement of my friend Annie Wyman, the full picture and implications of the lines started to become clear. I started to see the lines in assessing my clients, and then started building my structural bodywork sessions around these lines. “Moving toward publishing happened as a happy coincidence. One of my students (in my very small early classes for massage therapists in Maine) loved these lines, and said, “I’m going out to Hawaii to teach these lines to Lee Joseph’s students!” (His was another structurally-related school of bodywork.) I realized that if I was going to lay claim to this idea and have it come out correctly, I needed get it written down. At the same time, Leon Chaitow, N.D., D.O. was forming the Journal of Bodywork and Movement Therapies, and was calling in his chits with all his old friends to get articles to start this venture off. “The resulting journal articles proved so popular that Churchill Livingstone (who has since been swallowed by Harcourt, which was in turn swallowed by Elsevier) in the form of Mary Law asked me to write a book on the idea. The book was published in 2001, with the second edition appearing in 2009, and the 3rd in 2014. The book has been translated into 10 other languages – German, Finnish, Polish, Portuguese, Spanish, Italian, Korean, Japanese, Russian, and modern and traditional Chinese. “After the original publication, I found earlier iteration of similar ideas – in the meridians of acupuncture, of course, but also in the sketches of Leonardo, in Hoepke and Tittel, German anatomists of the 1930’s, and in the work of Françoise Meziére in France. These linkages (and such models as ‘kinetic chains’) are often defined functionally, whereas Anatomy Trains are connections through the fascial fabric, and as such are common pathways for myofascial force transmission. in Anatomy Trains classes and webinars. Anatomy Trains continues to build a more detailed curriculum tailored to individual professional needs. 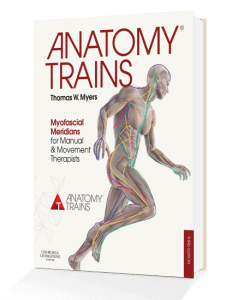 Tom says: “After I developed the Anatomy Trains map, it struck me – suddenly, like Saul on the road to Damascus – that the Anatomy Trains schema offered a logical lens through which to view Ida Rolf’s Structural Integration protocol. In other words, her ‘recipe’ could be reconfigured slightly to unfold via a progressive opening of these lines. Thus, Anatomy Trains Structural Integration (ATSI) was born. “ATSI uses the Anatomy Trains map to provide logical reason for the progression of our 12-series of SI sessions, understandable by professionals and the public alike. Students seem to agree, and the ATSI Professional Certification has flourished since, with nearly 500 fully-trained practitioners in the US and abroad. “ATSI is but one specific application of the Anatomy Trains schema. We are happy to see the Anatomy Trains applied in all kinds of modalities – Pilates, Yoga, Cross-Fit, personal training, physiotherapy, rehabilitation, physical education, and performance enhancement. “We are very grateful and humbled by the positive reception Anatomy Trains has received, and inspired by the ways it has been applied in many professions in different cultures.